Vancouver (December 10, 2013): Representatives from the Council of the Haida Nation, the Vancouver Canucks and The West Coast Fishing Club were reunited last night for the presentation of a Haida legacy art piece, which will have a home and be on display in the new Canucks Sports & Entertainment corporate expansion at Rogers Arena. Celebrating the ongoing relationship between the Vancouver Canucks and Haida Gwaii, the 6×6 ft. cedar ‘Pod’ carved panel by Haida artist Cori Savard was commissioned by the Council of the Haida Nation, The West Coast Fishing Club and Old Masset Village. As part of a first-ever community tour of the north coast, the entire roster of Vancouver Canucks players and coaches spent three days of distraction-free team bonding and exceptional late-season fishing at The West Coast Fishing Club’s – The Clubhouse. After a memorable time for all, they took helicopters back to Masset, where they were greeted by “Go Canucks Go” chants from a crowd of more than 2,000 fans at Old Masset Community Hall. The connection has continued to grow and the team recently introduced a Haida hat for the player of the game award. The traditional hand-woven and hand-painted hat carries meaning and gives the team a connection to the Haida people, whose art and culture bear so much importance to the Pacific Northwest. This art presentation symbolizes the ongoing relationship between the team and Haida Gwaii. 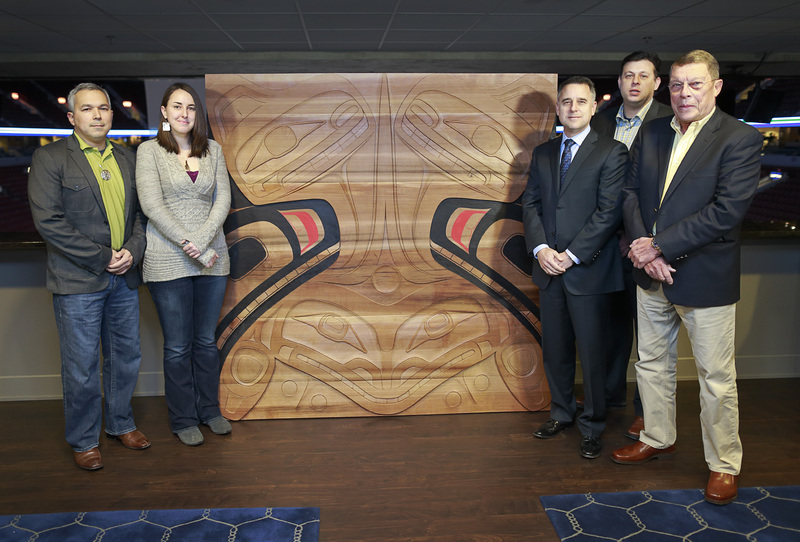 Pictured (L-R): Peter Lantin – President, Council of the Haida Nation; Haida artist Cori Savard; Laurence Gilman – Vice President of Hockey Operations & Assistant General Manager for Vancouver Canucks; Andrew Merilees – Mayor of Masset; Rick Grange – Vice President of The West Coast Fishing Club.